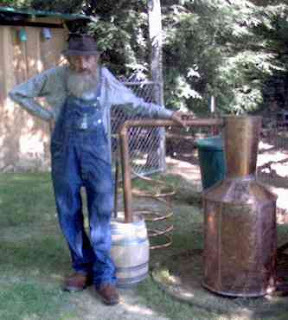 World-renowned moonshiner and American folk hero Marvin "Popcorn" Sutton (shown at left, along with one of his finely-crafted distillation apparatuses) has had his sentencing delayed until December 15th in U.S. District Court in Greeneville, Tennessee. Popcorn Sutton, you may recall, pleaded guilty in April following a raid by them meddlin' revenuers on his "likker makin'" operation in Cooke County, Tennessee. Widespread belief among Popcorn's many fans (and I consider myself one of them) is that if he had stuck with brewing the "white lightning" in his hometown of Maggie Valley, North Carolina, he would still be in operation today. Crossing the state line was a big mistake and now he's looking at a 15-year prison sentence and half-million dollar fine. Which is ridiculous because (a) Sutton is practicing a form of art that isn't necessarily immoral, and is deeply rooted in the heritage of Appalachia, and (b) if you know anything about Sutton's methods, you know his 'shine is probably the safest and cleanest to be found. No, I've never had the pleasure of touching the stuff... but ever since hearing about him a few years ago I've heard from plenty of folks who swear by his product. It's just another example of a government too big for its britches, come to step on one of the darned few unique individuals still dotting the American landscape. I guess if it can't be bought at a Wal-Mart or can have a tax imposed on it, it is automatically prohibited. The people who are prosecuting Popcorn don't have a clue. Here is America the way it used to be standing in their courtroom in a floppy hat and bib overalls... and they can't see that, they're so lost in their own elitism. "Makin' Likker with Popcorn Sutton, Part 1"
"Makin' Likker with Popcorn Sutton, Part 2"NOTE: The above photo of Popcorn Sutton is the property of Appalachian Traveller, used with permission. Just to correct a part of your article. Popcorn is actually from Tennessee, he operates an antique store in Maggie Valley. For questions about Popcorn and our efforts to have him named as a Tourist attraction contact (email: JRHafer@yahoo.com (Chris, thanks for your efforts and I like your style. Keep on producing your thoughts, we are all richer for them. To all who have been misinformed !! Marvin (Popcorn) Sutton, was born in Haywood County, N.C. Oct 5th, 1946 to Vader and Bonnie Cagle Sutton. I knew Popcorn's parents and they were just good old Mountain people. Hemphill, NC is home to Popcorn as well as East Tenn. Almost all of us here in Western NC have ties to East Tenn.
Oh this is rich, arguing about Popcorn's geography. Truth be told, there were thousands of "Popcorns" all over the eastern coast in the old days, and in the former CSA states in more recent years. Many like him in Neal's documentary especially in the southern Appalachians and the high terrain of SE TN, NW NC, NW SC & NE GA. It is a dieing artform, and again, truth be told, this particular "popcorn" would most likely not be jailed if he had stuck to copper and 50 gallon runs, rather then stainless mega gallon stills. (regardless of geography) That said, I still say, FREE POPCORN! I give greatest regaurds to a King of his art. TO hell with the government ..
Keep 'likker makin' in heaven. Regardless of where he is from, what he did in the eyes of the regulators is not worth the cost to our simple humanity. That the government hates competition so much that they would harass a man making untaxable liquor to this extent is truly pathetic. Laws or no laws, what Popcorn crafted was a dying art in the landscape of American history. At least his shine didn't make nobody go blind. Somehow it's okay if the 'legal' alcohol industry causes more problems than Popcorn ever did. I hope something starts going right with our country soon because I'm really starting to lose my faith in humanity. Sorry to tell you this but the county is Cocke County not Cooke. And Monday Popcorn Sutton commited suicide. He will be missed. It should be in the paper. And he was only going to prison for 8 months. I'm from East TN and I currently live in New York City. Whenever I go home I make sure and bring some homemade liquor back to NY. Popcorn was a legend and should be properly recognized for his contribution to our cultural heritage. It is beyond pathetic that the state of Tennessee did not celebrate his life and work. All of you folks who care about the craft of moonshining and the history of Appalachia should vote those dogs, Lamar Alexander, Bob Corker, and John Duncan Jr. out of office. You should be ashamed that your lawmakers did nothing. When you don't support your own culture you deserve the WalMart that you get. Perhaps "pop" "Corn" should have been more involved with NASCAR, Jr. Johnson God bless him got a pardon for his exploits. If the Government doesn't wake up than they will find those of us who are tired of their antics and WASTEFULL spending of our tax dollars are going to revolt. No taxation without "fair" representation. I bet the founding fathers are enjoying a sniff right now with Pop Corn! I just read about Mr. Popcorn Sutton for the first time ever, My deepest condolences to his wife and family. You folks are fools. It wasn't rap recording or "illegals" that sentenced Popcorn. It wasn't government taxes. It was your own elected Republican representatives that allowed this to happen. You all act as if the government is something other than yourselves. You are the government. You ridiculous hillbillys voted for those lawmakers and now you want to blame it on "rap recording". Its no wonder you've lost your heritage. You haven't earned it. our own elected 'republican' representatives? you think democrats want likker legalized? what planet are you from. there is no republican and democrats. it is one party, the state, it doesnt matter if it is carrying the calling card of a republican or democrat.